HollywoodChicago.com: What first attracted you to filmmaking? The Room screens Feb. 11th and Feb. 12th at the Music Box as part of the 2011 Love is Blind Tour. HollywoodChicago.com: How did “The Room” evolve during its journey to the screen? Wiseau: It was supposed to be a play first, and I was shopping [it around] at the time. The script is based on 600 pages of a novel that I wrote a long time ago. But first it was supposed to be a play. I don’t know if you know this, but I studied psychology for many years, and I concluded that the number of people in America going to the theatre are much less than the number going to the cinema. Even a small production costs an arm and a leg, and [if] the play [runs] four or five weeks, you can make a film from it, you can do a documentary, but that’s not enough…And certain stuff happened with “The Room” that I had not predicted. HollywoodChicago.com: How did your background in psychology assist you in your exploration of relationships in the film? 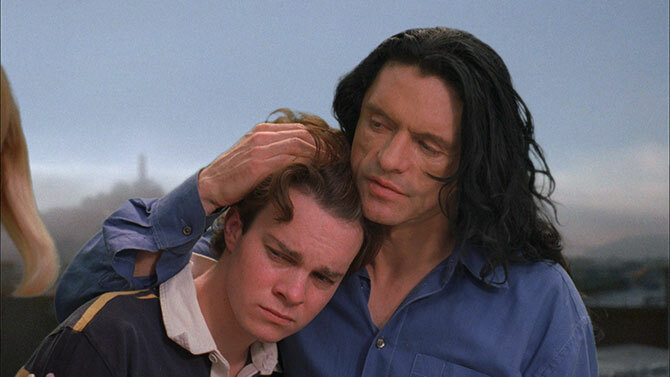 Wiseau: It absolutely helped me. I did some research. Prior to shooting, I talked to people on the street in San Francisco. I asked them questions like, “What do you think about relationships? You think two is better than three?” And I got weird reactions to this statement: ‘What are you talking about two and three?’ I say, “Two is great but three is a crowd.” At the same time, I noticed people were very open. I was attending school at Laney College in Oakland. I did the same sort of survey and I noticed, ‘Wait a minute, a lot of people have the same problems, the same issues of relationships, you know?’ Keep in mind that was fifteen years ago when I conducted the survey…Environments may be different, situations may be different, but if you put all that stuff on the side, we’re still on the same page, meaning we do have some issues. Even in strong relationships between, let’s say, a girl and guy, or just a friendship, you still will have difficulty adjusting to certain situations, and that’s what “The Room” comes from. It does relate to my life, and I bet you relate to it somewhat. Tommy Wiseau and Juliette Danielle star in The Room. HollywoodChicago.com: What are some of the problems that you observed plaguing modern relationships that you wanted to capture in the film? Wiseau: That’s a good question. I would say trust, that’s my number one thing. Trust, compassion, feelings, and over[arching] elements, like how far you can go as a friend. I’ll just give you one example: when Denny is talking to Johnny in the movie, and he says, “I’m in love with Lisa.” We have in today’s society situations between three friends where he or she can love your boyfriend or girlfriend or whatever, but love [them] as a person. You don’t have to do physical sexuality, people forget about this. It’s okay to love someone as a person, as a human being. We forget that because we [have] certain structures in society where people go, “No no no, that’s wrong.” No no no that’s right, because the more you express your emotions, the better. Philip Haldiman and Tommy Wiseau star in The Room. HollywoodChicago.com: The ads for the film have repeatedly claimed that it was “filmed with the passion of Tennessee Williams.” How has Williams been an influence on your work? Wiseau: Tennessee Williams as well as Orson Welles and Hitchcock and others—I say and always will say that we’re on the same page because we’re dealing with human behavior. It’s not conventional behavior, but the behavior relates to realism. It’s not a fantasy, even though for example, some of Hitchcock’s work could classify as a fantasy, but there’s a realism within his work. Orson Welles and Tennessee Williams are the same story. We’re on the same page because they are dealing with human behavior directly. You can ask yourself, ‘What is behind the words, what is behind the image?’ I rest my case. So we all can relate to it. Even if we destroy all the DVDs of Hitchcock or “The Room,” the message is still there. That’s why people connect through their work. I can watch some of their work over and over and I’ll never get tired of it, to be honest with you, because I always find something new to make me think and create something as well. HollywoodChicago.com: You and Greg Sestero go way back. Is it true you met in acting class? Wiseau: Yes, we met in class, that’s correct, at Jean Shelton [Actor’s Lab] in San Francisco. We met there and when I decided to do the movie, I asked if he wanted to be a part of it. We did a scene in class and became good friends. The first thing Greg wanted to do was be a line producer because he had certain skills. By the way, on “The Room” I had four different assistants, and he was one of them. I cast him as Mark and keep in mind that in “The Room,” we always have double actors. So we have two Marks, two Lisas, etc. We did replace the actors as well as the crew during production because of certain tampering [with] my work, because I already had a vision. I never approached big studios, big sharks except for distribution. One studio we approached to distribute. Their studio name started with a ‘P.’ That’s all I’m going to tell you. You probably know who they are. They are the biggest. HollywoodChicago.com: This was also the first major film role for Juliette Danielle. Wiseau: Juliette did an excellent job. Keep in mind that she was actually an understudy. She was supposed to play Michelle, but then I changed it because she did a good job. Again, I just want to inform you—I hope you can write about it because a lot of people miss it—we had a rehearsal process. It took two or three months to rehearse because I believe in preparation…[and] interaction between actors. I don’t like when actors are talking to walls. I want a real person actually on the set. 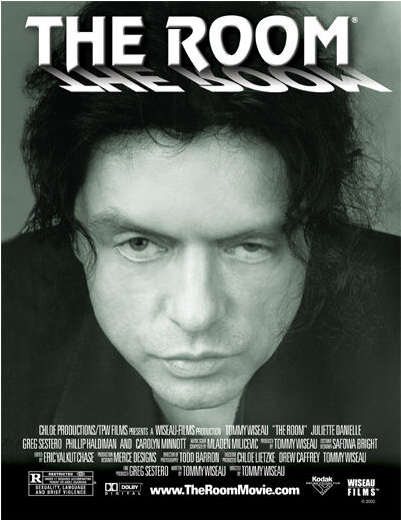 Juliette Danielle, Tommy Wiseau and Greg Sestero star in The Room. HollywoodChicago.com: Why was so much of the dialogue dubbed in the film? Wiseau: The dubbing was done in ADR. What we did was intentional. People classified “The Room” as a melodrama and I differ. It’s not a melodrama, that’s number one. Number two, certain stuff was done intentionally to provoke the audience. I’m talking as a director right now. Some people misunderstood what is behind my job as a director. Because you see, we replaced the crew four times, we replaced the actors four times, and as the director, I did everything from scratch. Music is from scratch, everything is original. We did not replace different shots with [footage] from the free Internet library, like people have said. HollywoodChicago.com: What did you learn about the difference between 35mm and HD formats during production that you plan on including in your book? Wiseau: We shot the film in both formats [simultaneously]. A couple times we had problems with angles, and we couldn’t put [both cameras] in the same place, so we adjusted them. One camera wouldn’t be able to handle the 45 degree angles, so we had to adjust the plate slightly. Overall, it was a rollercoaster ride because at the time, all of Hollywood was very against HD. Today it’s a different story. One of the biggest obstacles was [the fact that] not a lot of people on the crew knew how to operate the HD camera…Somebody recently asked me if the cost of the HD camera was $30,000. That’s incorrect. It cost $100,000, that’s a fact. Wiseau: That was a fun project. It was sponsored by Comedy Central, and made for Atom.com. It was a great experience but we’re not on the same page a hundred percent. I was hired as an actor and I did what they told me to do. But after our premiere at Comic Con, I thought they could do at least 30-40 percent better. That was my take on it. But they did what they could. It was something different and I enjoyed it. 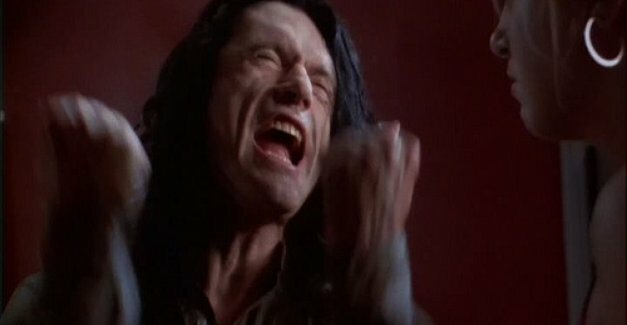 Tommy Wiseau delivers a dramatic portrayal in The Room. HollywoodChicago.com: Did you enjoy exploring your comedic side after your dramatic work in “The Room”? Wiseau: Oh absolutely. If I have a job, I’m open. I always say very openly that I’m open for big parts in the big studios as well as independent [projects] when people are serious about it. I don’t really like to talk about myself but to be nice I will respond to your question. If I can affect people and they smile, I did a damn good job. [laughs] That’s what entertainment is. I’m going to Chicago today, and I’m thrilled to report that the two shows are sold out, and a new screening was added. So I like when people enjoy this film, and negative [reactions] don’t bother me. I always say that you can laugh, you can cry, you can express yourself, but please don’t hurt each other. HollywoodChicago.com: Are you enjoying the experience of being embraced as a cult icon, or would you rather be taken more seriously as an artist? Wiseau: Well let me put it this way, [if] they laugh, that’s great, no problem. But I like your second statement. I like to be [known] as an actor, not as a cult [figure]. You’re right on the money, I commend you for this question. I like when people challenge me. Yes, I prefer the second part, to be known as an artist, but it could be [a] comical [artist]. I’m talking as an actor right now as well as a director partially. The more colors you have, the better it is, that’s my take on it. What I mean by colors is, the more you put on the table, [the better]. I challenged a reporter a few weeks ago. I said, “Give me the words, I can make a story for you if you want.” He gave me the words, I gave him the story, and I got his reaction, and I think that’s what entertainment is. HollywoodChicago.com: What has been your most memorable experience of screening this film with an audience? Wiseau: I have a few of them, but one of them was very memorable: when people ask, “Can you marry me?” [laughs] That was really funny and it stuck in my head, and I think it will be stuck there for a while. ‘The Room’ stars Tommy Wiseau, Juliette Danielle, Greg Sestero, Philip Haldiman and Carolyn Minnott. It was written and directed by Tommy Wiseau. The film screens Feb. 11th and Feb. 12th at the Music Box. It is rated R.
Submitted by Ted (not verified) on February 14, 2011 - 7:20am. Wow, Tommy is great. “The Room” changed my life! Submitted by HollywoodChicago.com on February 14, 2011 - 3:03pm. Happy to hear it! Changed your life how? Submitted by soccergoals (not verified) on August 30, 2012 - 6:53pm.